With experience and ‘time served’ comes expertise. With over three decades in domestic construction in Liverpool and commercial refurbishment,Fiveways Contractors has the history and reputation to guarantee a first-class job, upfront and honest working relationships with customers and a confidence that you will recommend us to others. 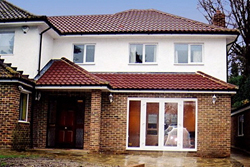 Listed below is just a sample of the kind of building work we are happy to undertake. There are many benefits to having a loft conversion and at the moment with many homeowners preferring to extend their home rather than move they are a cost-effective and excellent way of realising space in your home. 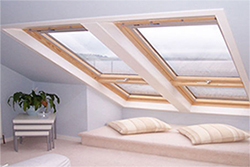 Most homes can accommodate a loft conversion and by having this work done it can enhance kerb apppeal and substantially improve your lifestyle as well. Planning permission is not usually required for a loft conversion, which saves a lot of time and money, and using a professional and reliable company such as Fiveways Contractors who are well versed in this kind of extension, the loft space, new stairs and finishing touches can make this new space feel like it’s part of the original build. The kitchen is the hub of the home. 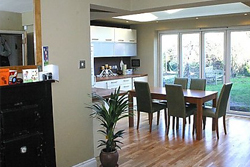 A well-planned and well-executed kitchen extension can substantially transform living space in your house and dramatically alter your home life for the better. An enlarged dining kitchen means more space, families can eat together in the heart of the home, kids have somewhere to do homework, parties can go with a breeze and they can constitute an extra living room. Whether you decide to opt for a single storey or two-storey kitchen extension (which may include an extra bedroom or bathroom upstairs), even small houses can be made to feel spacious, light and airy if you hire a reputable building contractor to undertake the work. You could end up with the kitchen of your dreams without the time, expense and stress of moving house. Kitchens ordinarily are at the back of the house and can be sociable places where everyone meets. Wrap-around, or side-return extensions, offer a huge amount of flexilbility when you’re planning to rearrange the layout of your home. Wrap-arounds extend sideways onto the path or driveway and provide options such as adding utility rooms, adloined garages, as well as extending upwards with the inclusion of new bedrooms and bathrooms. It’s wise to seek the advice of an experienced and repuatble builder before planning a project on this scale. The end results, with the right contractor, are well-worth the effort. And even though this kind of building work could add substantial value to your home, you’ll never want to move. Very few people use garages for cars these days so why not maximise the space in your home and convert this dead space into a new living area? More often than not, garages are used for storage: lawnmowers, garden furniture, tools, holiday paraphernalia and huge piles of junk that you keep meaning to sort through and throw out. 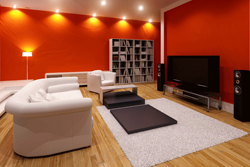 Converting your garage into usable living space can transform how you use your home. Easily converted into a kids’ playroom, a home office, library, guest room, downstairs bathroom or even a home cinema or entertainment room. Take your pick. Fiveways Contractors can guarantee sound advice and a high level of workmanship on this type of easy and extremely cost-effective home improvement project. Customer satisfaction and expectation: These are key considerations to a successful retail outlet and if customers receive the standard of service they rightly expect, business will boom. So, if you’re thinking that a refurbishment of your shop may improve customer satisfaction Fiveways Contractors can offer pre-project help and advice and point you in the right direction. Whether it’s just a lick of paint or wholesale reconstruction of the layout of your premises, including extensions and annexes, we can advise you on any refurbishment project at a budget to suit with a detailed project scope. 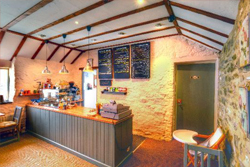 Whether you run a coffee shop, a bar or bistro bar, high street shop, restaurant or a local convenience store careful consideration of any project needs expert guidance. Give us a call. Trying to find a builder? Find out about our ‘Five Way Care’ promise to you.